Despite recent criticism of militia groups by Mexican President Enrique Peña Nieto, the federal government has signed an accord granting institutional recognition to the so-called “self-defense” groups in Michoacan state. Federal and state officials signed an agreement with several vigilante leaders in Michoacan yesterday which will allow them to be recognized as part of the Rural Defense Corps, a little-known volunteer force under military jurisdiction. According to the text of the agreement, members of vigilante groups may also join municipal police as long as the legal requirements are met and prospective members have the support of local officials. In exchange, the militias will have to turn over lists of their members to the Secretariat of National Defense (SEDENA) and register their weapons. As El Universal reports, the government is emphasizing that the accord states these groups will be temporary. But neither the length of operation nor the terms of their service are specified in the text. The move comes in the wake of the Peña Nieto administration’s repeated calls for the groups to disarm themselves and allow security forces to take up responsibility for law enforcement in the state’s volatile Tierra Caliente region. Just last week in an interview at the World Economic Forum in Davos, the president said that if the vigilantes were genuinely interested in improving security, they should join the police. “The Mexican government cannot be permissive nor tolerate the presence of [these] groups, even if they may be genuine about wanting to defend themselves,” Peña Nieto said. The unexpected recognition of the militias demonstrates that the government is still grappling with an embarrassing Catch-22: while the vigilantes showcase officials’ inability to provide security, their popularity makes it difficult to disarm them without public backlash. The announcement coincides with the arrest of one of the four top Knights Templar Cartel leaders, Dionisio Loya Plancarte. As the AP points out, the timing of this may help the government save some face, distracting from its concession to the self-defense groups. 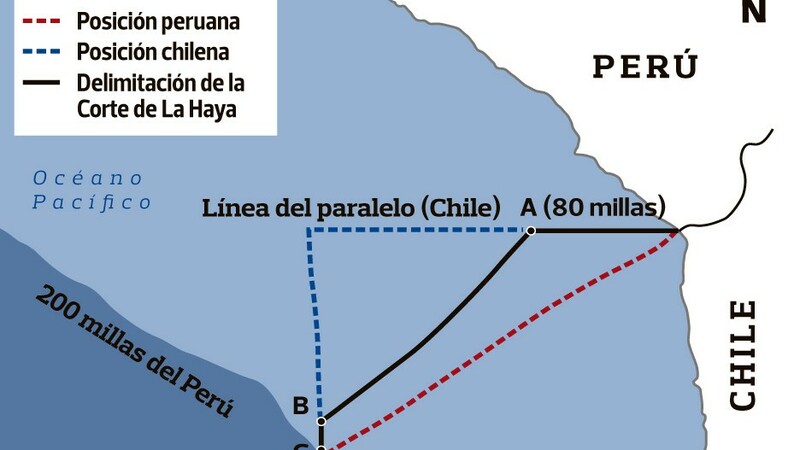 The International Court of Justice at the Hague yesterday issued a long-awaited ruling on the maritime border dispute between Peru and Chile. The court sided mostly with Peru’s claim, although it kept rich coastal fishing grounds within 80 nautical miles of the border in Chilean hands, the New York Times reports. Chilean President Sebastian Piñera announced that while he disagreed with the ruling, he would abide by it, though it would be implemented “gradually.” Peru’s El Comercio reports that Piñera and his Peruvian counterpart, Ollanta Humala, are set to meet tomorrow on the sidelines of the CELAC summit in Havana. After roughly a year and a half of serving as an advisor to Mexican President Enrique Peña Nieto on security issues, Colombian police chief Oscar Naranjo is returning to his home country in March. Noting his popularity in Colombia, Semana questions whether his return will boost President Juan Manuel Santos’ reelection campaign, with the magazine even speculating that he could be poised to be the next vice president. Immediately after swearing in, the president announced a new law enforcement operation involving the military and police, known as “Operation Morazan.” While the operation seems to differ little from previous operations involving military patrols in the country, La Prensa notes that the controversial military police force (the “Tigres”) has now officially gone into operation. Brazilian authorities have launched an investigation into the shooting of a young protestor at the hands of police during a Saturday demonstration against the World Cup. Fabricio Chaves, 22, has been hospitalized and is in critical condition. O Globo reports that police say Chaves was carrying an explosive device in his backpack, and attempted to assault one of the officers when stopped. The New York Times looks at the inauguration of the first phase of the Mariel Port renovation project in Cuba, which is being financed by Brazil, as well as the surrounding “special development zone.” Cuban officials hope the area around the port, which will allow foreign companies to operate with far less bureaucracy than usual on the island, will help bring in much needed foreign investment. So far the popularity of the project is difficult to determine, but the paper notes that companies in China, Malaysia and Angola have expressed interest. The NYT also features an interesting profile of Argentine Economy Minister Axel Kicillof, a rising star in Argentine politics. While President Cristina Fernandez has been avoiding the public eye in recent month, Kicillof has been steadily raising his profile since he was appointed in November. The Washington Post editorial board has a column in today’s paper on the European Union’s consideration of normalizing relations with Cuba. The editorial argues that an upcoming February 10 meeting of EU representatives should be used to solidify a position showing the Cuban government that any investment in the country must be linked to progress on democracy and human rights. Remarks by Colombian President Juan Manuel Santos on drug policy reform at the World Economic Forum in Davos, Switzerland yesterday have generated a flurry of media attention. But while Santos spoke about a potential turning point in drug policy on the international stage, his administration is also facing a unique political opening for drug reform in the ongoing peace talks with FARC rebels. Santos spoke at a panel on drug decriminalization featuring Colombian President Juan Manuel Santos, former United Nations Secretary General Kofi Annan and Texas Governor Rick Perry. While the first two have openly called for ending the criminalization of drugs before, Perry raised eyebrows by touting his promotion of drug courts in the state as a path towards decriminalization. A spokeswoman for the governor confirmed this to the San Antonio Express-News, though she stressed that Perry was opposed to outright legalization. As El Tiempo reports, Santos framed his support for alternative drug policies not only as a security strategy, but also as a human rights issue. “How I can tell a campesino from the mountains of Colombia who grows one hectare of marijuana that he could go to jail for that, when in Colorado or Washington state it is legal to smoke it?,” he asked attendees. According to the president, this “contradiction” illustrates the need for a global debate on drugs, though he did not specify any particular policy remedy. El Espectador notes that Santos also repeated past calls to approach drug reform through international consensus, not unilaterally. CNBC and El Colombiano report that Santos was hopeful that progress on the issue could be made at a number of upcoming forums, including the UN Commission on Narcotic Drugs in Vienna in March and the planned 2016 UN General Assembly Special Session on Drugs. An abundance of drug policy reform hype paired with a lack of substance seems to have become a recurring theme at the annual forum in Davos. Last year, for instance, Guatemalan President Otto Perez Molina made waves by announcing that he would host a summit for world leaders and policy organizations on alternative drug control proposals in Tikal, but the event never happened. Meanwhile, Santos did not mention the ongoing peace talks with the Revolutionary Armed Forces of Colombia (FARC) in Havana, which are currently centered on the issue of drug trafficking. On Thursday, the rebels closed the latest round of negotiations by presenting another plan to radically alter Colombia’s drug policy. Like previous proposals by the guerrilla group, this statement calls for the state to recognize health and medicinal uses of coca, marijuana and poppy plants, as well as to regulate their cultivation. Also this week, Uruguayan President Jose Mujica, whose government passed a historic marijuana regulation law in December, offered to meet with FARC and President Santos at the CELAC summit in Havana next week. As a former guerrilla turned politician himself, the Uruguayan president seems well qualified to mediate between the two parties, especially on the issue of drug policy reform. According to Caracol Noticias, Santos said Mujica had so far made no official request to meet with him, though he said it would be possible to talk on the sidelines of the CELAC conference. Bogota Mayor Gustavo Petro has bought himself a few more weeks in office, at least. Yesterday the Administrative Tribunal for Cundinamarca province suspended his removal order, finding that it violated the mayor’s political rights, El Espectador reports. The AFP notes that Petro’s defense lawyer said the Colombian Inspector General’s Office is expected to appeal the decision to a higher court, however. A new poll by Chilean research center CERC shows widespread support for President-elect Michelle Bachelet’s main policy proposals. According to the poll, 80 percent of those surveyed agreed with education reform, 63 percent backed tax reform and 71 percent supported an overhaul of the Chilean constitution. Bachelet, who takes office on March 11, was initially rumored to unveil her cabinet picks yesterday, but the announcement has been postponed to later today. La Tercera has some speculation over her potential choices; according to the paper, OAS Secretary General Jose Miguel Insulza is rumored to be a top contender for Interior Minister. BBC Mundo looks at the symbolism of the big Community of Latin American and Caribbean States (CELAC) summit in Havana next week, noting that it demonstrates Cuba’s success in overcoming regional isolation. The Brookings Institution’s Foreign Policy Program has released a collection of policy recommendations for U.S. President Barack Obama going into 2014, “Big Bets & Black Swans: A Presidential Briefing Book.” The report contains only two memos pertaining to Latin America, one pertaining to Cuba and the other to Venezuela. The first, by Ted Piccone, urges the president to “double down” on engagement with Cuba and expand trade, travel and communications with the country. The second, by Harold Trinkunas, warns that economic instability in Venezuela could lead to popular violence and ultimately threaten U.S. oil interests. Trinkunas thus recommends that Obama “begin a conversation” with Brazil (whose interests are also at jeopardy) to encourage Venezuela to shift its economic and political policies. The New York Times reports on a rare instance of seemingly spontaneous demonstration in Cuba, sparked by a crackdown on vendors selling unlicensed goods at a market in the southeast city of Holguin. In response, dozens of newly self-employed workers reportedly marched to local government offices and demanded the right to work without interference from authorities. A video posted to YouTube lends weight to the reports, although the NYT suggests that the fact that it was posted by a militantly anti-Castro group may cast doubt on the claim that the incident was not organized by dissidents. With only days left before their current term ends, legislators in Honduras’ outgoing Congress passed a law breaking up the state-controlled electricity company ENEE on Monday. Reuters and El Heraldo report that the move will divide ENEE into three parts in an effort to pursue investment in the electricity sector and bring down costs. RNS of Honduras Culture and Politics has a less positive take, criticizing the law as an abuse of the dominant National Party’s majority before the opposition takes a greater share of seats. As the governments of Chile and Peru ready themselves for a Hague ruling on a decades-long ruling over a maritime border dispute, Reuters reports that both countries have promised to abide by the decision. The latest issue of Jacobin magazine features an interesting overview of Bolivia’s political economy under the Morales administration, which looks at the clash between the Bolivian president’s anti-neoliberal rhetoric and his economic policies. While Morales’ economic strategies have earned his government some surprising praise from the IMF and World Bank, they have cost him and his party significant support among left-wing intelligentsia. Just as the Venezuelan government rolls out changes to its currency exchange system, Caracas-based journalist Girish Gupta has an overview of the incredible distortions caused by currency manipulation in the country. As a result of the government’s fixed exchange rate, those with access to U.S. dollars are able to take advantage of the black market rate to reap extraordinary profits, while those without such connections struggle to make ends meet. In other currency news, the Argentine peso fell by 8 percent against the dollar yesterday, the most since the country’s devastating financial crisis in 2002.